Add Picture to PDF for generate convert Photo to PDF conversion can convert GIF into PDF, BMP into PDF, JPG into PDF, PNG into PDF and TIF into PDF. Create PDF from images, photos into PDF document, graphics into PDF pages. Images to PDF page maker add insert turn make convert combine made PDF doc from still or snaps Picture2PDF generator conversion developer creator utilities tool program modify page size, image size and page margin. Alcohol (ethanol-water) gauging, blending and dilution calculations. Convert between density and strength for any two of Density, Mass %, Volume % (ABV), Proof or Molar %. Data for -20C to 100C (-4F to 212F). Blend by mass or volume. Hydrometer correction calculator. Volume temperature correction. Determine pure alcohol content of a blend. Calculate freezing point temperature or strength. Image to PDF converter software can change high resolution image and graphics text to PDF file without degrading original PDF file. Application provides option to change or set page and image such as page size, page margin and image size. Software supports multiple image formats such as JPG, TIFF, PNG, BMP, GIF, EMF and WMF. If you want to image to PDF converter so this software is best for you and download this software by link www.join-pdf.com. Desktop calculator and expression evaluator. Evaluate simultaneously multiple expressions. Support for parantheses, user variables, scientific notation, decimal, hexadecimal and binary bases. Trigonometric functions and bitwise operators. Compact and extended modes. 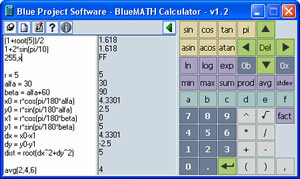 Calculiware es un programa freeware (gratis) para Windows que incorpora una calculadora de bolsillo sencilla, completa y rapida, un convertidor de unidades fisicas (longitud, area, masa, velocidad, fuerza, etc), calculos estadisticos sencillos (media, desviacion, etc), dibuja funciones y calcula prestamos e hipotecas. Dispone de Ayuda desde el mismo programa. De gran valor educativo para estudiantes de Bachillerato y ESO. Free, compact, capable tape calculator. This expression evaluator processes complex expressions like "-ln(1+2)*3% + sin(4 5\6)^7 to hex" and allows exact rational values like 2 1\3 instead of 2.3333... Compact single-line mode or flexible multi-line editor to edit past work, recalculate, cut and paste on the tape, save to file, restore. Select font, button size. Show/hide buttons. Number bases: binary, octal, hexadecimal. Group digits. Help. Free calculator for Windows with an editable "tape", which makes everyday calculations more convenient. Performs plus, minus, multiply, divide, square root, and percent calculations, allows text comments. Implies no limitations on precision and provides controllable rounding-up. Remembers everything forever and allows one to browse through full calculation history as if it were a text and reuse numbers or correct any misprints at any moment.